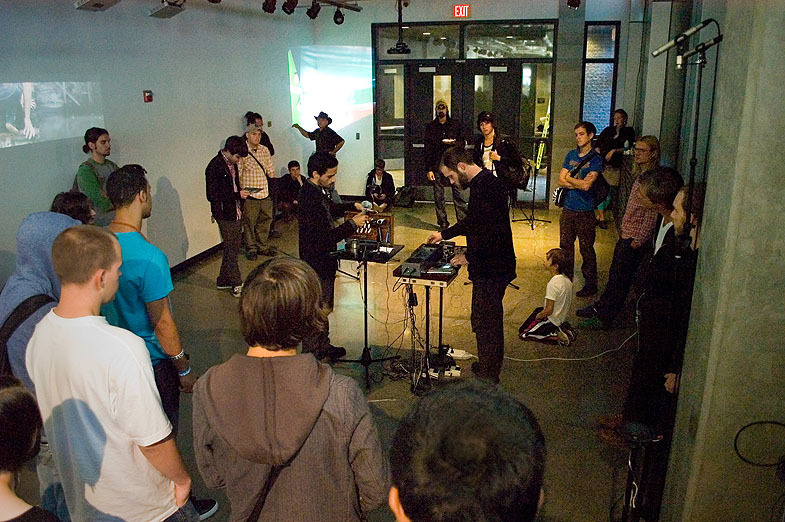 Copse proposed an “acousmatic dispersal” and sculptural extension of a shruti box in time and space, to invite the active perception of direct and reproduced sounds in relationship to their sources. The products and byproducts of the shruti box were atomized, dispersed and shuffled spatially and temporally, in an effort to present the parts-to-the-whole relationships as fluid and continuous. The live and recorded sounds were distributed to a set of installation speakers via the Inductive Mixing Table I, a flat surface designed to pick up signals from tiny speakers and other magnetic sources and dispatch them to eight speakers placed away from it. Inductive Mixing Table I functions as an expressive diffusion instrument in that it is immediately responsive to the manual gestures of speakers dragged across its surface. Fixed and flattened, The Pleasance & The Purchase invites a private question of where a listener finds their footing.